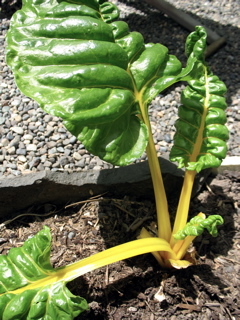 I love growing chard, but find that it can be a bit much on its own. I will absolutely be making this one. Thank you for the photographic details, as I would have thought they would not stay together so well. I wonder if you might make these with other greens, such as amaranth or orach? Yes, Carol, I would imagine it would work well with those greens though I don’t have much experience with either of them. Try it and let me know how it works. Kind of an odd feeling to be reading a recipe for these staples that have never really had a recipe. I just happen to have some in the kitchen along with the tomato sauce with lots of parsley that is on its last legs. 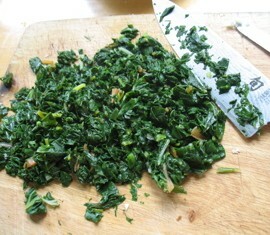 Some of my chard is beginning to bolt too so I picked lots, froze 2/3 and made patties out of the rest – without cheese for Vita, with cheese for us. Thanks for the idea! I made these for the kids tonight, I had a whole bunch of Kale from the SIO CSA (where I learned about your blog last week), that needed to be cooked and this was the perfect solution! I made them with a combo of mozzarella and parano and my eight-year-old thought they tasted like pizza. So glad this was useful today. It’s really very adaptable and as you say, the kids tend to like it. My son gobbled up 3 tonight! These look great Katherine. What an awesome idea. I’ve had a too-much-chard season and thought I was getting creative but clearly I was not! I’m currently facing too much Italian kale. I just made these with a side of spicy sauteed prawns – they were awesome!! And vitamin packed! These were a big hit with the hubbie last night – thanks! So glad Debbie. And what about you? Did you like them? They are definitely a favorite in our house-hold. Making these again after y 9 year old son begged me (which didn’t take much convincing since I also thought they were amazing. The difference this time is my oven decided to go out and it is in the middle of my kitchen waiting to be repaired (or replaced depending on what the repairman says tomorrow) so I steamed the chard in my microwave steamer, then chopped it up. Seems to have worked pretty good. I did add some onion and garlic powder and some Franks red hot sauce instead of the red pepper flakes (easier to get to with my stove in the way). They are all mixed up and ready to go for dinner. I will be cooking them in my George foreman grill or my sandwich maker (whichever one I can get to easier 🙂 ). Thanks again for a GREAT and HEALTHY recipe my kids love!! Thanks for the report Leesa. Hope they did well on the grill. Good for you for making do. They are such a great vehicle for getting veggies in folks and most importantly, very delicious. They turned out just as delicious as the first time…..Thanks again for a GREAT recipe!! I just made these and they are DELICIOUS! I used kale, gouda and parmesan. Thanks for a great recipe. 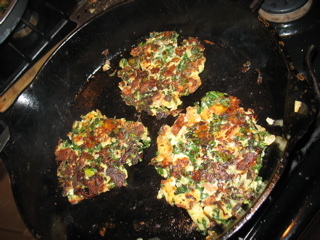 I love having an easy idea for using leftover greens and cheeses! That’s fantastic Brooks! So glad they worked out.